You are currently browsing the tag archive for the ‘Pinehurst’ tag. 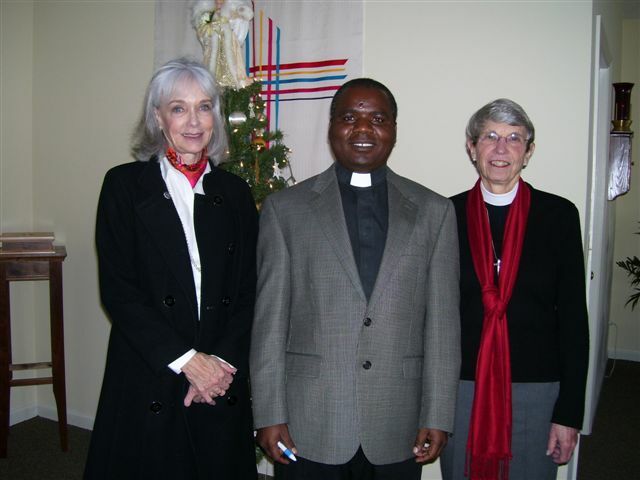 Moses may have parted the Red Sea but The Reverend Canon Moses Matonya, dean of Msalato Theological College in Tanzania came to Pinehurst, North Carolina and for 5 days shared with many of us his love for and his unfailing trust in God, in spite of living in a hard land with grueling poverty. I’ve tried to think of a word to adequately describe Moses ~ one really isn’t enough ~ but AUTHENTIC comes first to mind. There are others ~ loving, happy, intelligent, warm, man of God ~ the words are endless. He had been in the U.S. once before with his wife Ruth. Then he stayed in an apartment in Georgia during his year there. This time, he has stayed in private homes and he commented on how nice it was for him to see how Americans live and never with any sound of envy or admonition that we have such an abundance of everything. I was embarrassed for him to see all the clothes in the guest room closet and Jessie said that maybe he didn’t know that I had other full closets! I have to tell you, this great man did the breakfast dishes each morning at my house. To briefly sum up his time with us for those of you who did not meet him, he spoke at the Country Bookstore in Southern Pines and graciously signed his book: “Real Power: Jesus Christ’s Authority Over the Spirits.” Jessie and I have a few copies if any of you are interested in having one. We drove to Greensboro to meet with Bishop Chip Marble and The Reverend Leon Spencer who spent a great deal of his ministry in Africa. This was New Years’ Eve Day and Bp. Marble was very gracious to take us all to lunch at his favorite place on what was a day off for a bishop. He too is a great man whose passion is anti-racism and truth and reconciliation. Moses saw the movie, Avatar in 3-D and liked it. I was afraid it would be too violent for him but it had a good message. He had already seen Invictus about Mandela. Jessie and I put him on a plane later Sunday afternoon for Washington, DC where he will be the guest of Dean Ian Markham at Virginia Theological Seminary in Alexandria for 4 weeks. He will be translating his book from English into Kiswahili and having some respite from his work in Dodoma. I for one still feel the warmth of his smile in my home and Jessie and I feel very connected with him, his family and his people. Pray God we can return next summer for what has given me a rich blessing and a new direction in life. Oh yes, he ate black-eyed peas on New Years’ Day. Maybe a silly tradition, but one that I hope brings him good health and good fortune in 2010. Thank you all who came out to meet him and to hear him preach. What a message he gave us all.